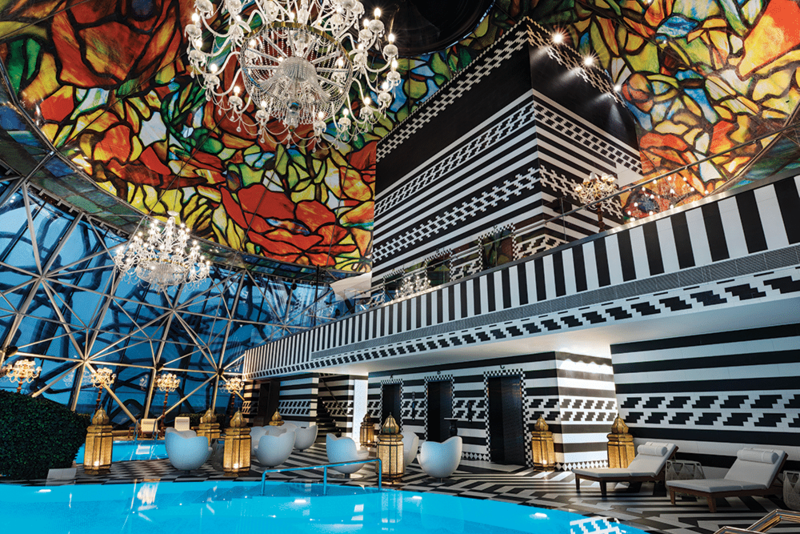 With interiors by audacious Dutch designer, Marcel Wanders, this luxury hotel opened less than a year ago, in October 2017. Among its more unusual interior design and decor features are oversized, Alice-in-Wonderland ish whimsical white pillars dotted with golden eggs, and a black, swirling staircase with Arabic motifs which spirals up from the lobby. How many hotels can combine a quirky fairytale feel with Middle-Eastern exoticism? 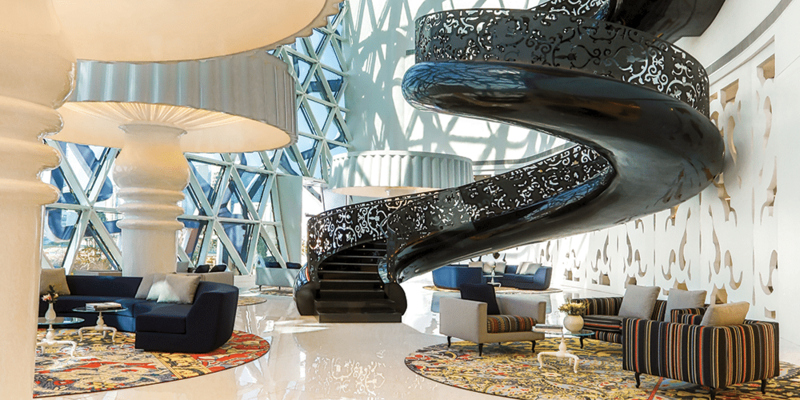 Above: The black, swirling staircase with Arabic motifs which spirals up from the lobby of The Mondrian Doha. 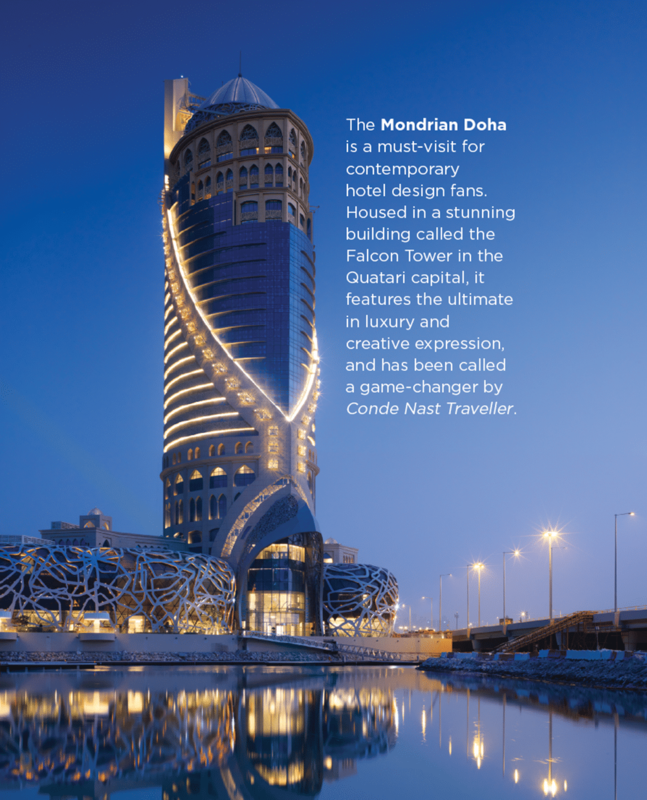 Above: The Mondrian Doha, housed in a spectacular tower. 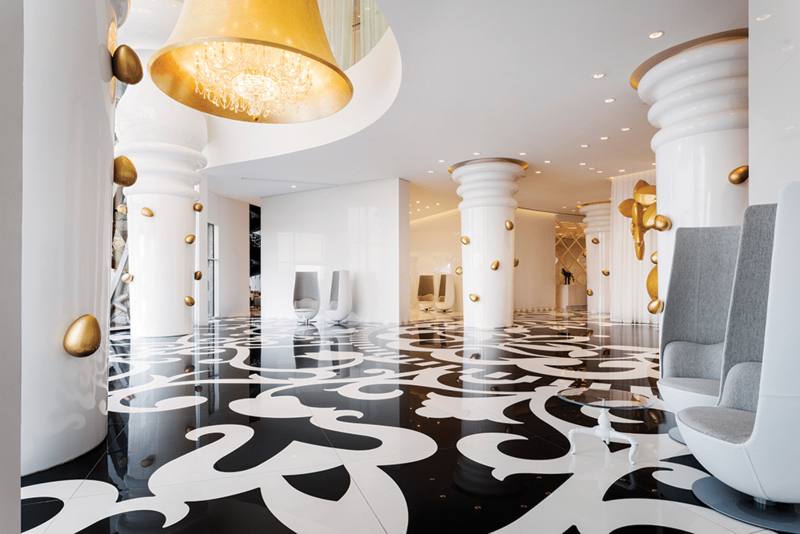 Above: The Mondrian Doha is full of quirky touches, such as the black & white patterned floor and gold details. Traditional Arabic celosia (lattice screen) designs can be seen as a motif throughout the hotel, from the bold designs on the lobby floor to the floating staircase and the pretty metal floor lamps in the rooms. The designer also looked to 1001 Nights for ideas – Arabic script, local patterns and historic souks, while white walls and huge windows make an elegant, light-filled atrium space. Colours follow a sophisticated palate of monochrome with gold accents. 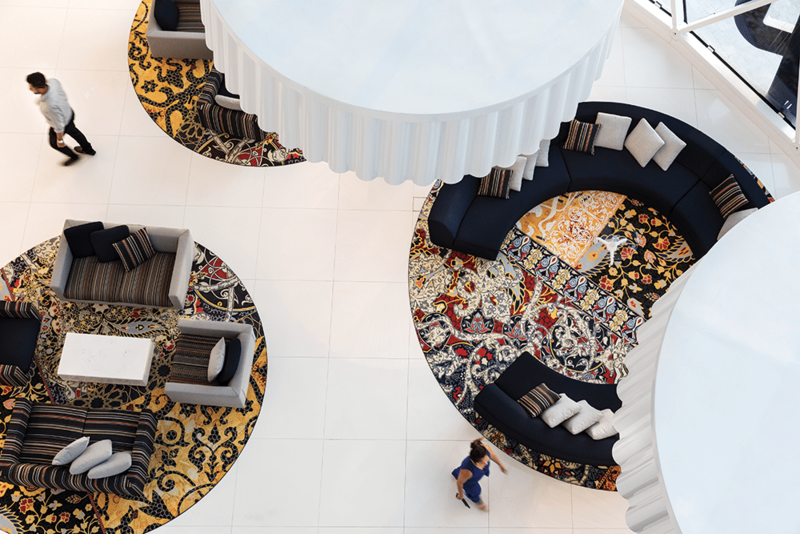 Above: A striking design statement from every angle, the lobby’s circular floor rugs create islands of colour against the blank canvas of a white floor. Guests can experience the ultimate indulgence in the 211 bedrooms and 29 suites over 24 floors, including royal penthouses, and VIP units, with Islamic-style mosaic ceramic tiling and glamorous black and gold floor rugs. The bridal Opal suite has a dressing room, make-up room and bridesmaid’s bedroom, with a 24-carat lift straight down to the ballroom for the ultimate dramatic entrance, while the 850 m2 two-storey Penthouse suite has three bedrooms, private quarters for butler, chef and maids, as well as an entertainment room. Above: The swimming pool manages to combine Art Nouveau-style stained glass with English country garden (a hedge-covered bridge over the pool), and Moroccan bronze lamps and bold tiling. As you’d expect, the gastronomic offerings are top-notch, with sophisticated contemporary dishes at Cut, whose chef is the famous Wolfgang Puck, and the Japanese restaurant Morimoto, the chef’s first restaurant in the Middle East, while Walima offers Middle-Eastern food with a suitably souk feel – a maze of coloured lamps hanging from the ceiling, creating a fun and joyful atmosphere. Hudson Tavern has a more urban ambience, with parquet floor, wooden tables, and exposed brick walls offering informal meals like burgers. Above: As the hotel’s website has it… “The sky’s not the limit. It’s our address.” Located on the 27th floor, Rise cocktail bar offers spectacular views, while the hand-painted glass dome fills the room with magical hues. 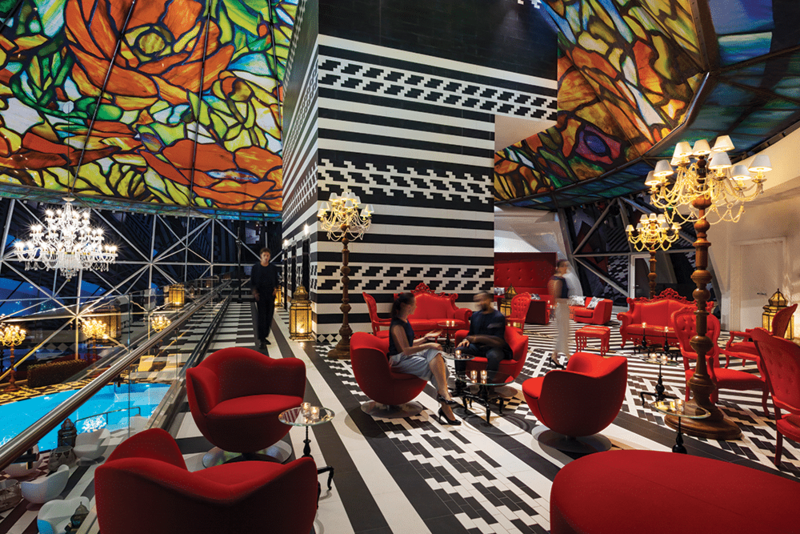 Along with Magnolia Bakery in the lobby and a poolside bar, the global feel is completed by a Cuban bar which features a Maarten Baas Smoke Chair for Moooi. The ESPA delivers an unforgettable wellness experience hidden in the Secret Garden. 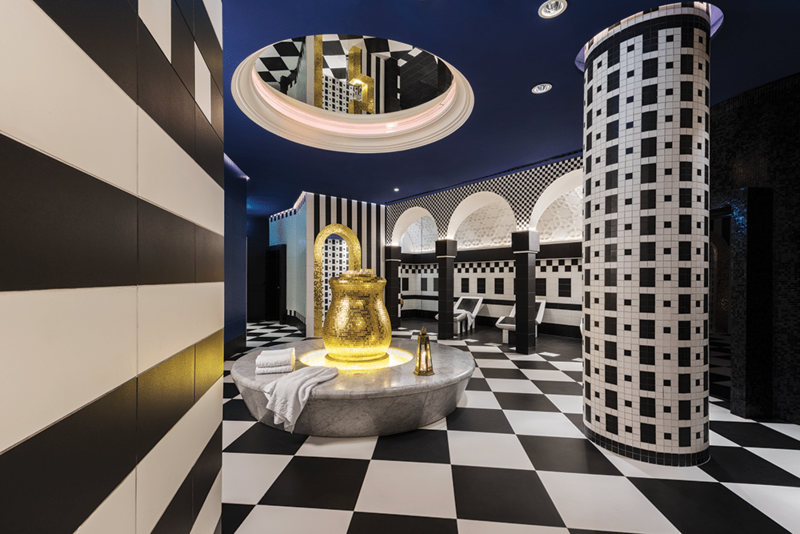 Shimmering mosaic walls lead guests to the 12 treatment rooms, a heated experience garden, relaxation rooms and a traditional Turkish Hammam. The female spa is a haven of peace and purity with beautiful white and pink mosaic walls creating a perfect feminine energy. Dark blue, grey, white and black combine to create a bold, masculine environment in the male spa (pictured below). Read our interview with Marcel Wanders here.